Our Summer 2010 Newsletter addressed the four “Es” of powder coating, Energy, Ecology, Economy and Excellence. There is, however, a fifth “E” that doesn’t get as much recognition as it deserves. A complement to the 4th “E”, which is excellence, the 5th “E” is what is known as “E-Coat”. Combining E-Coat with powder coating provides superior product finishes that offer excellent corrosion capabilities, as well as a scratch-resistant and durable finish. So what exactly is E-Coat? Electrocoating is an immersion painting process in which charged paint particles are attracted to an oppositely charged metallic surface. As the paint is deposited, it forms a finish, which begins to insulate the metal from the surrounding charged solution. Deposition continues until the coating thickness becomes sufficient to form a barrier against further paint attraction. 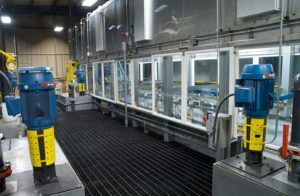 Electrocoating offers several advantages in the finishing of metal products. Corrosion resistance is superior to other paint application methods because immersion E-Coating dramatically cuts material costs because paint waste is minimal. Virtually all of the coating put in the tank goes on the product and stays on the product. In addition, low solvent, waterborne formulations make electrocoating the perfect environmentally friendly finish. E-Coating provides a complete, uniform coating — even in corners, on edges, and in hard to reach partially enclosed spaces. Because the applied coating contains very little water, there are no runs or sags, and parts can be handled almost immediately. Consistent, controlled application, without spray gun error, nearly eliminates the need for manual touch-ups. 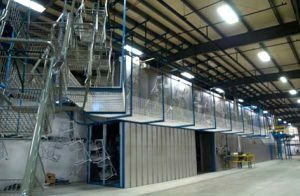 The marriage of e-coat to powder coat in the Finishing Industry is responsible for creating real excitement about this new combined process. Extensive testing has demonstrated the excellence of the product. In some instances, Salt Spray tests reached 5,000 hours — a figure almost unheard of in the Finishing Industry. Scratch resistance tests were also better than seen before. Such results have already attracted several industries to adopt this combined process. Some companies also use a final liquid top coat for quick color change. This enhances appearance, while still offering quality performance unrealized in the industry before. One of the most popular applications is the shopping cart manufacturing — an industry heretofore plagued by rusting chrome and other dangers of life spent in a parking lot. The new approach of combining electrocoating and powder coating has been so successful that it has been adopted by appliance equipment manufacturers and others whose products are continuously exposed to either outdoor weather conditions and/or rigorous indoor usage. Both of these scenarios require products to be protected from rusting, scratching and so forth. In cases where powder is the application of choice, epoxy is used as the primer coat. This offers excellent scratch resistance qualities for indoor use together with a protective liquid color coat it can be used outdoors. Alternatively, just polyester or polyurethane may be used, when minimal color and an exterior application is required.